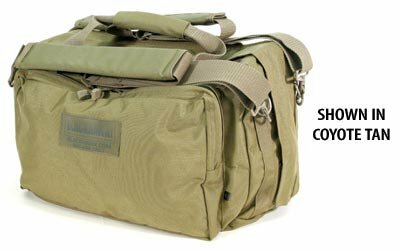 Both sizes of this operator-friendly gear/travel bag can be used as a backpack, shoulder bag, or storage bag. Constructed of 1000 denier nylon with reinforced stitching for durability. Full wraparound carry handles with handle grabber for superior weight support. Wide handle for comfortable carry. #9 YKK zipper and protective cover. External lockdown zip-flap. Heavy-duty D-rings for securing external items and shoulder straps. Two padded, detachable shoulder straps. Medium MOB Dimensions: Total: 24"L x 12"W x 9"D = 3850 cu. in. ; One large pocket: 22"L x 10"W x 2"D; Two small pockets: 10.5"L x 10"W x 2"D.